Everything starts with an idea. Everything that you see around you — your phone, computer, car, coffee mug — all that came from someone’s mind. There’s nothing quite like coming up with a winning idea, one that leads to something successful. It'd be great to be able to do that every day but, unfortunately, our minds don’t work like that. Some days you’ll have dozens of ideas floating around your brain, other days there’ll be nothing, nada. If you work in any sort of creative industry, these idealess days are like nightmares. And the more you’re tasked with coming up with ideas, the quicker your brain turns to mush. You know what helps? Getting together with a group of friends and colleagues and working on ideas as a group. The next time you hit that creative wall, get a squad together and brainstorm. Spend some time shouting out ideas and writing them down. Again. Write ideas down. Even when you’re by yourself. Document every idea. Even if it’s not useful now, it might be enough to ignite that creative spark somewhere down the line. When it comes to brainstorming, there is no one better to follow than the godfather of brainstorming, its inventor, Alex Osborn. The more ideas, the better. Quantity over quality. The wilder the idea, the better. Improve on, and combine, existing ideas. All these will help you to come up with usable ideas. Besides, if you’re working with others, it’s good to go the digital route with brainstorming to document the process easier and not have to decipher other people’s handwriting (important!). We’ve compiled 5 apps that will come in handy. 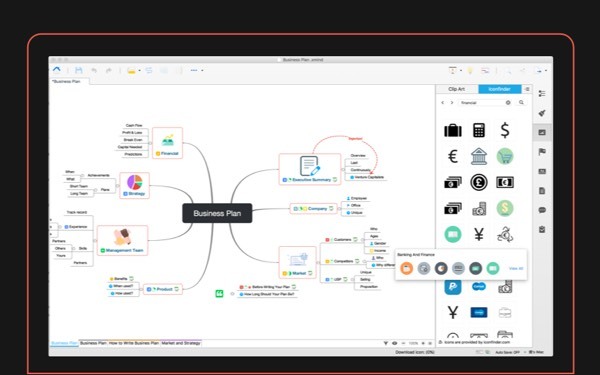 XMind is one of the most popular mind-mapping software on the planet. It’s brilliantly simple to use and features a brainstorming mode to document ideas with minimum fuss. Choose from the list of pre-made templates or draw your own cartoonish mind map and bring it to life with a range of icons, images, and clipart. The absence of any real learning curve is a big part of what makes XMind so great. At the same time, its powerful slide-show presentation and Gantt view modes are what really sets it apart from the competition. The cloud integration allows you to sync, view, and edit mind maps online on all of your devices so that you can brainstorm on the move. 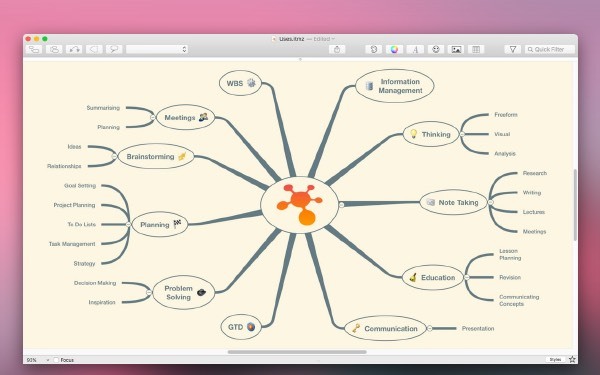 If you want to get in-depth with your brainstorming and mind mapping, you’ll love what iThoughtsX brings to the table. The app boasts multiple layouts, map styles and link styles, and features over 200 built-in icons, clipart images, and background canvas designs. You can change colors and fonts, insert hyperlinks, add notes, and embed documents across all major file formats. Basically, anything that you want to achieve with a mind map can be done here. iThoughtsX also lets you import and export from many of the most popular desktop apps, including XMind and Excel. Like XMind, cloud integration is second to none, and maps can be edited across devices. Be Focused doesn’t offer mind mapping. On the face of it, you probably wouldn’t consider it as a brainstorming tool either, but it is one. And a very good one at that. The app, as its name suggests, is designed to help you stay focused on the task at hand, to be more productive in your daily work. Within its wide selection of tools is the ability to brainstorm ideas and place them into lists for safe keeping. There are also little tools like a work interval timer and goal tracking that can be applied to brainstorming sessions. Speed brainstorming, why not? 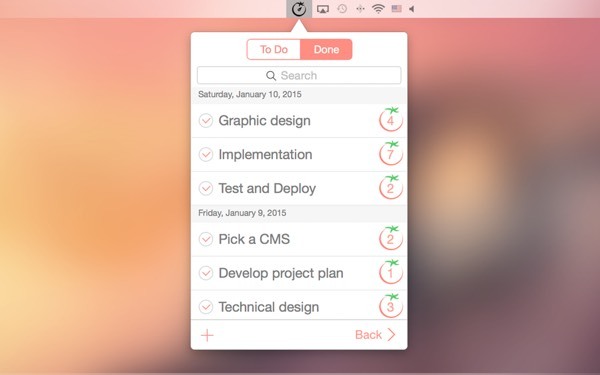 Like XMind and iThoughtsX, Be Focused is available for iOS and macOS. Not all great ideas are formed in text. For artists, ideas are drawn. Tayasui Sketches is the most realistic drawing (and painting) experience you’ll find on a computer. Seriously, it’s the closest we got to drawing on paper. The app lets you create patterns, paintings, and drawings using a huge range of colors, brushes, pencils, gradients, and layers. If you can use it in real life, you’ll find it here. What’s more, the app has a large community where work can be shared and discussed. A must-have for artists of any sort. Focused: just you and your brainwriting. Sometimes, the birth of an idea requires nothing more than a blank sheet of paper. Be it a page in your notebook or a note in your Focused app. 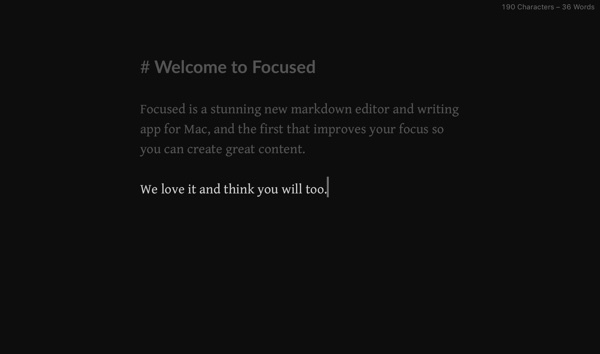 Focused is a simple, elegant and essential app that focuses solely on giving you the creative space to brainstorm, gather ideas, and detail thoughts. Notes are easy to create, save, and find to work on. Try Focused and you'll be falling in love with app's minimalist design and zen-mode - there's nothing to distract you, just you and your minds. 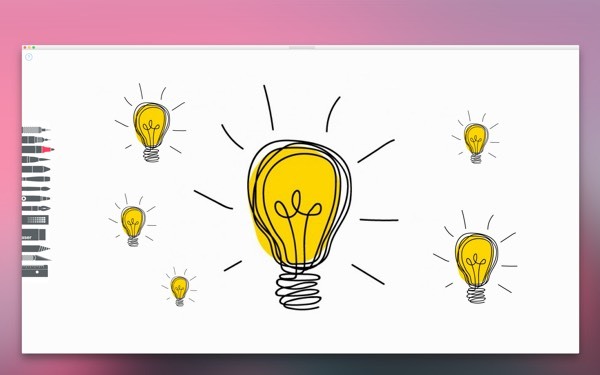 So get together with friends, use XMind to brainstorm, export to iThoughtsX to perfect ideas, set a timer with Be Focused and draw and write down the full fleshed out version of what you are trying to create. It’s worth to try.